November’s election may have delivered a significant blue wave, sweeping Democrats into power in the House of Representatives and throughout several states. But in the weeks since the election, it has become increasingly clear that, despite these historic gains, our democracy remains deeply in peril. And that peril is not just a product of the ongoing chaos emanating from the White House, what may be uncovered by the Mueller investigation, or President Donald Trump’s various tantrums of executive power. It seems increasingly clear, for example, that the Georgia gubernatorial race, claimed by Republican Brian Kemp, turned on a deeply troubling strategy of systemic voter suppression, at a scale big enough to swing a very close election. Meanwhile, conservatives in state legislatures from Wisconsin to Michigan to North Carolina are frantically considering measures to constrain incoming progressive lawmakers, changing electoral rules and readjusting the powers of offices—governorships, attorneys general, state courts—soon to be occupied by progressives. In Wisconsin alone, for example, Republicans who still dominate the state legislature, despite a popular vote victory for Democrats—thanks to extreme gerrymandering—are fast tracking bills that would severely limit the powers of the incoming Democratic governor, transfering litigation authority from the incoming Democratic attorney general to the Republican-controlled legislature, curtailing early voting, and moving the dates on the next wave of state supreme court elections to avoid the likely spike of Democratic turnout associated with the 2020 election. These are all measures designed to further lock-in conservative power and hamstring the new progressive officeholders who won in November. These appalling efforts highlight a deeply disturbing reality: that our politics is predominantly shaped by a shared effort to concentrate and entrench political power, in opposition to progressives elect, advocacy organizations, and aspirations to a more racially—and economically—inclusive society. Nor are these efforts at power-hoarding new. Rather, they are just more blatant and extreme versions of what has been a sustained conservative strategy for years. From “right to work” laws that broke the back of organized labor—effectively shifting power toward big business and swinging presidential electoral results by nearly four points (according to some estimates)—to systemically undermining access to the ballot by communities of color since the 2013 Supreme Court’s gutting of the Voting Rights Act, these strategies have been key to conservatives for decades. While Trump and his allies have been dealt a major setback, the reality is that, while the prospect of a multiracial, progressive electoral coalition grows both at the state and federal levels, efforts at hoarding power and dismantling democracy will likely become even more frantic, extreme, and explosive. This means that, if progressives are to restore democracy and defend our country’s foundational commitment to political voice—particularly for communities of color and the poor—we must seize this moment of crisis to affect a radical, structural transformation to our underlying political and economic institutions, in order to rebalance political power. What we need is nothing less than a radical reconstruction of our existing democracy. This is not the first time aspirations of greater democracy have been fractured and undermined by a violent, dangerous, and blatant power grab. In the early days after the Civil War, Reconstruction offered what remains one of the most visionary expansions of American democracy. For a brief moment, under the protections of the Thirteenth Amendment, Fourteenth Amendment, and Congressional Enforcement Acts of 1870 and 1871, it appeared as though the country might meet, for the first time in its history, the aspiration for a multiracial, economically inclusive suffrage. Where freed persons were able to organize independently, they exercised newfound political power, winning elected positions (more than a thousand African Americans were elected to office at the state, local, and federal levels), and forged early multiracial coalitions of workers and farmers, challenging the old power structures in the South. This moment, however, was not to last. Threatened by this new movement, white elites and former Confederates unleashed a campaign of racial terror aimed specifically at intimidating and fracturing these multiracial coalitions. In the 1870s, however, the Supreme Court intervened, first throwing out the convictions of William Cruikshank who led the massacre of dozens of African Americans in a paramilitary coup that overthrew the local electoral results that had swept black Republicans into power. The Court then continued on this march, striking down congressional civil rights legislation, and in doing so neutering the promise of the Fourteenth Amendment, and ushering in the era of Jim Crow. A century later, however, the civil rights movement—the “Second Reconstruction”—broke through the suffocating exclusions of Jim Crow, and the prospects for a more racially and economically inclusive democracy were, again, made briefly more tangible through the rise of social movements, new legal institutions, Brown v. Board of Education and the judicial desegregation of schools, the Civil Rights Act of 1964, and the Voting Rights Act of 1965. Here too, however, these legal bulwarks were quickly countered. Like Cruikshank and the Court a century ago, the backlash of the late twentieth century sought to reassert racial hierarchy and economic inequality, but this time the tactics were more subtle. Wealthy suburbs seceded from cities in order to avoid sharing their public schools and public parks with communities of color. In more recent decades, as the conservative legal movement has gained greater control of the judiciary and the Department of Justice, conservatives have also eroded the gains of the Second Reconstruction. The Roberts’s court blew open the doors to voter suppression, as well as unabashed corporate power and undue electoral influence by the wealthy through cases like Shelby County v. Holder, which threw away the heart of the Voting Rights Act, gutting its protections against racially discriminatory electoral machinations, and the infamous Citizens United case that opened the floodgates of unlimited corporate money in politics. These past waves of democratic expansion and retrenchment highlight three key lessons for progressives today. First, the “crisis of democracy” is not new, and it is not localized to the threats posed by our current norm-busting President; rather it is an ongoing struggle that has been waged over the degree to which communities of color and the poor actually exercise real political power and voice. Second, insofar as this vision of a multiracial, bottom-up democracy has been (briefly) realized, it has been through the building of grassroots movement power, and the creation of legal institutions—from the Fourteenth Amendment to the Voting Rights Act—that can enforce ideals of inclusion and equality over the long haul. The Reverend William Barber, currently leading a new poor people’s campaign across the country, has called our current moment a “Third Reconstruction.” Like the First and Second Reconstructions, this is a moment where progressive social movements are actively mobilizing around a radical vision of racial and economic inclusion; and as in the past, this potential progressive vision is being violently and vociferously opposed. What we need is not just the extraordinary burst of grassroots organizing and movement-building of the last few years; what we also need is the conversion of this grassroots energy into durable legal and institutional change, capable of transforming the very political, economic, and social fabric of our democracy. What would such a Third Reconstruction look like? Congressional Democrats’ newly-revealed bill, House Resolution 1 (which complements Elizabeth Warren’s Anti-Corruption and Public Integrity Act in the Senate), is a good start. The bill proposes major democratic reforms, including automatic voter registration, public financing of elections, and significant ethics reforms. But in addition to these institutional changes, a rebuilt, inclusive democracy will require further transformation. There are at least four additional areas in which progressives should focus. First, progressives should advance independent redistricting commissions at the state level, preventing future gerrymandering, and consider a greater push for D.C. statehood and Puerto Rican independence to create a better balance of power in the Senate. Progressives should also advance a national campaign to end the disenfranchisement of people with past felony convictions, following Florida’s transformative lead in passing a state constitutional amendment that restored voting rights for over 1.4 million residents. Second, we need to create more robust systems to counteract the blatant attempts at rigging, stealing, and nullifying elections. The reauthorization of the Voting Rights Act, restoring federal “preclearance” oversight of state electoral administration is a first step. But events like those in Georgia, Wisconsin, and North Carolina will become more and more likely. Unfortunately, we currently lack the legal and institutional tools to redress and prevent these types of activities. Defeated Democratic gubernatorial candidate Stacey Abrams, and her supporters, have launched a powerful and innovative new lawsuit alleging that the cumulative effect of Kemp’s tactics in Georgia—purging voters, the use of unreliable voting machines, and more—represent a violation of the Constitutional right to vote under the Fourteenth, First, and Fifteenth Amendments. Section 2 of the Fourteenth Amendment authorizes Congress to reduce Congressional representation for states in a degree proportional to the number of voters whose access to the ballot is “denied…or in any way abridged”—a remedy that has yet to be fully deployed. Third, as a growing number of scholars have argued, economic inequality is closely related to political inequality: Wealthier constituencies are more able to influence policy outcomes, while concentrated economic power and wealth has historically been seen as a foundational threat to constitutional democracy. Just as the right has systematically used “right to work” legislation to break organized labor, and thereby undermine the political power of workers—and of progressives—we need a progressive equivalent to dismantle the concentration of corporate and economic power. Whether through increased antitrust enforcement, or a more strict regulation of finance and Wall Street, restrictions of corporate power will be critical to removing a key driver of unequal political influence and policymaking that exacerbates inequality. Fourth, rebalancing political power and institutionalizing greater voice for low-income families and communities of color will require embedding values of democratic inclusion into the day-to-day governance of our economy and society. Many of the most pernicious forms of skewing public policymaking operate outside of elections and big legislative measures. Business interests and wealthy constituencies are more likely to have their desires reflected in the day-to-day administration of public policy. Thus, to empower our less advantaged citizens—and to dismantle deep inequalities—progressives need to find ways to institutionalize voice for all citizens in ordinary administration and in local bureaucracies. This might include increasing community representation and participation in city-zoning decisions and in the allocation of infrastructure spending. It may also involve ensuring that communities of color have greater footholds to shape the governance and oversight of the police. These footholds are key to fueling further grassroots organizing—and provide a critical stepping stone for communities, and individual leaders, to exercise more influence in the policy arena. We are in the midst of a major debate about the crisis of American democracy, and the concern that American democracy may be about to collapse. But this sense of sudden crisis overlooks two critical truths. First, for many Americans, democracy has always been a myth. 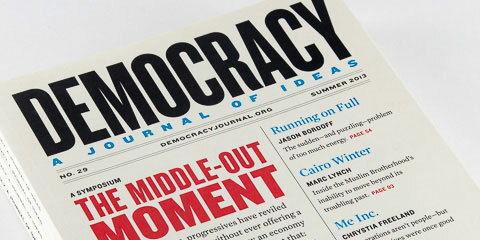 Second, our current crisis of democracy has been underway for several years, despite its current acceleration. If progressives are to rise to this moment of crisis, they must advance a bold, transformative agenda of structural democracy reform. This means going beyond easy appeals to “restoring norms” or returning to the days of alleged bipartisan comity of yesteryear. It also means going beyond traditional Democratic policy fixes, and instead working to transform our underlying political, economic, and social institutions, creating the foundation for a multiracial, inclusive democracy. If we do so, we can help create the kind of democracy that America has so often aspired to—but never fully achieved. K. Sabeel Rahman is the President of Demos, and an Associate Professor at Brooklyn Law School.